Oftentimes we, the madhab followers, are confronted by those who describe themselves as Salafis, for not following daleel (evidence) but instead following a madhab. I have come across some who cannot even read a verse of the Qur’an without making serious mistakes, yet they claim to be able to interpret and follow the daleel. One wonders how can someone in such a state follow and interpret daleel? Through a series of exchanges and observations, I found them to be nothing more than blind imitators of the contemporary Salafi teachers. These very teachers claim to understand, interpret, and follow the daleel all while promoting anti-madhabism. At length, I came to realize that when a young man of utmost ignorance claims to follow the daleel instead of imitating an Imam of a madhab, he is in fact insinuating that his Salafi teacher follows the daleel but the Imam’s of the four madhabs don’t. Thus, I wanted to find out to what extent the learned Salafis or the Salafi teachers themselves follow the daleel (evidence). What is meant by “following the daleel” is that a qualified scholar gathers, on a given subject, all the proofs and then derives a ruling following the thorough analysis of the complete body of evidence (daleel). This involves sifting through a quarter of a million hadith spread across more than three hundred hadith books as well as hundreds of volumes of books of each madhab. Thus, if we find a learned Salafi giving fatwas without knowing the positions or the evidences of the Imams, he is betraying this principle. I selected three examples from learned Salafis, including the owner of the above quotation, to demonstrate to the reader that in fact Salafi teachers do not adhere to their own principle. If they stopped at that, we would have said that is their choice. But they go on declaring some of the practices of the madhabs as INVALID or CONTRARY to the Sunna without having looked at the evidences used by the madhabs. 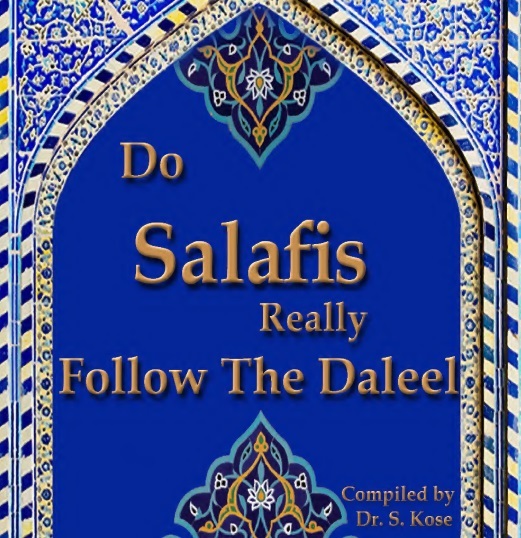 So, if the Salafis themselves do not strictly follow the daleel, then why do they call the madhab followers to their way under the slogan of “Follow the Daleel from Qur’an and Sunna!”? I will attempt to answer this question at the end of the booklet God willing. May Allah make this little effort a means by which the truth can be understood. All praise is due to Allah and may His peace and blessings be upon our master Muhammed, upon his family, his companions and upon those who follow in his footsteps until the Day of Judgment. Ameen! Fn. 1- Later in the booklet, under the title “What Did The Imams Mean by “If the hadith is authentic, it is my way””, I listed a selection of the books of Hanafi madhab just to show the reader what it will take to examine the evidence of one madhab let alone four.